Michael Kenna is one of those rare people who have resisted the fast pace dictated to us in today’s rushed city life. Kenna prefers to take his time and work alone... slowly. He has been doing this for over forty years. When he explores a new location he never knows ahead of time how long he will be there: a few minutes, some hours or days. He often returns to the same place repeatedly over a long period of time. As Kenna says: “It’s like connecting with a friend; you never know how long a conversation will last and which area the conversation will go into.” This attitude extends to his working method in the darkroom. Kenna still works in analogue only. He photographs primarily with Hasselblad film cameras and spends hours in the darkroom developing the perfect photographic print as if he was chiseling a sculpture. The resulting atmospheric imagery expresses a unique zen-like tranquility. Initially influenced by the European masters Bill Brandt, Eugene Atget and Josef Sudek, Kenna has been photographing in Asia since the mid eighties, particularly in Japan, and more recently in China, India, Korea, Thailand and Vietnam. He admits to being strongly influenced by the sense of serenity and calmness in the Asian landscape. It harkens back to the essence of haiku poetry, the power of suggestion over description. “I’ve also looked at Asian calligraphy and traditional sumi-e paintings. These artworks have been very influential. My style has grown increasingly more minimal and sparse”. Michael Kenna currently resides in Seattle, Washington, USA. 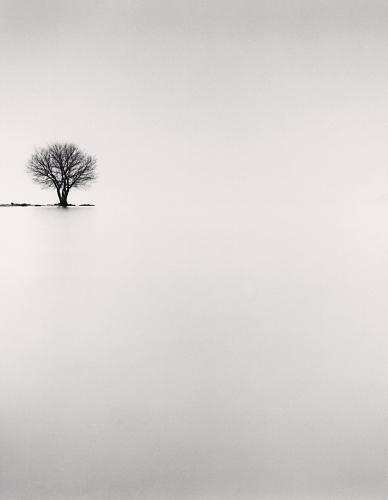 Michael Kenna, Kussharo Lake Tree, Study 5, Kotan, Hokkaido, Japan. 2007. Silver Gelatin Print. Edition of 45. Here is the story behind the tree in Kenna's own words. It is the perfect accompaniment to his photos. "In the winter of 2002, I was most fortunate to have a serendipitous meeting with a glorious Japanese Oak on the banks of Kussharo Lake, Hokkaido, Japan. That particular morning was brutally cold with heavy snow falling relentlessly. The lake was completely frozen over and white. I remember the muffled silence of the place, broken only by the piercing calls of hungry swans as they slid across the ice. "I have photographed many trees, but this one had a special character. Like an oversized bonsai - elegant and graphically powerful. There was something quintessentially Japanese in its shape, rather like a woodblock print. Looking through the camera viewfinder, I could imagine red kanji characters descending down one side of the photographic frame. My imagination conjured up a wise, old woman bent over the lake. I wondered what she must have observed from her keen vantage point over the many years she had been there. "Since that first encounter, I returned to make photographic portraits of the tree whenever I could. Between my visits, branches broke and fell. To my eyes, this aging tree remained graceful and resilient. I began to regard her as a dear friend and I greatly looked forward to our many reunions. "Then, in August 2009, the tree was suddenly cut down. Apparently, she was situated on the edge of a camp site and there was concern that people who climbed on her could fall into the water if more branches broke. The demise of the tree was reported in Hokkaido newspapers - somehow it had become quite well known as 'Kenna’s Tree'. Despite my sadness, this sweet association made me smile. "I did not visit Kussharo Lake again until February 2013, when I finally made a return pilgrimage. It was as cold and frozen as my first visit. Of course, the tree was no longer there. Just an empty space where my tree had stood serenely for all those years. But the hungry swans still called out in their haunting manner for their morning food, and the lake was once again iced over, silent and still. "Time passes, change inevitably occurs, friends come and go, and yet, in a curious way, things stay the same. I have extremely fond memories of this secluded winter hide-out, the home of the lovely Kussharo Lake Tree. I will surely return there in the future to walk, listen, remember, and perhaps photograph some more." As featured by My Modern Met. Short profile on the photography and techniques of Michael Kenna. Michael Kenna as discussed by Ted Forbes from 'the Art of Photography'. 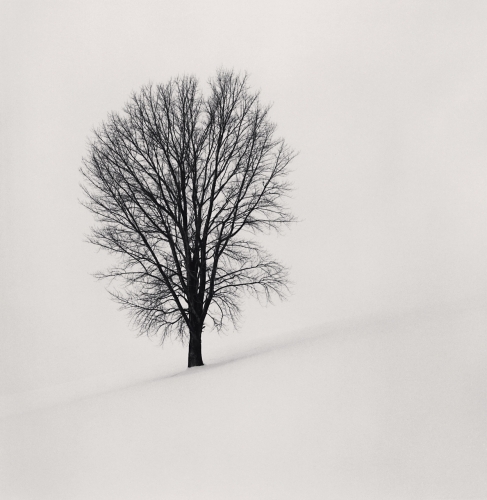 If you wish to receive Michael Kenna’s e-catalog with more information regards available prints and prices, please submit the form here below and we will revert real soon.